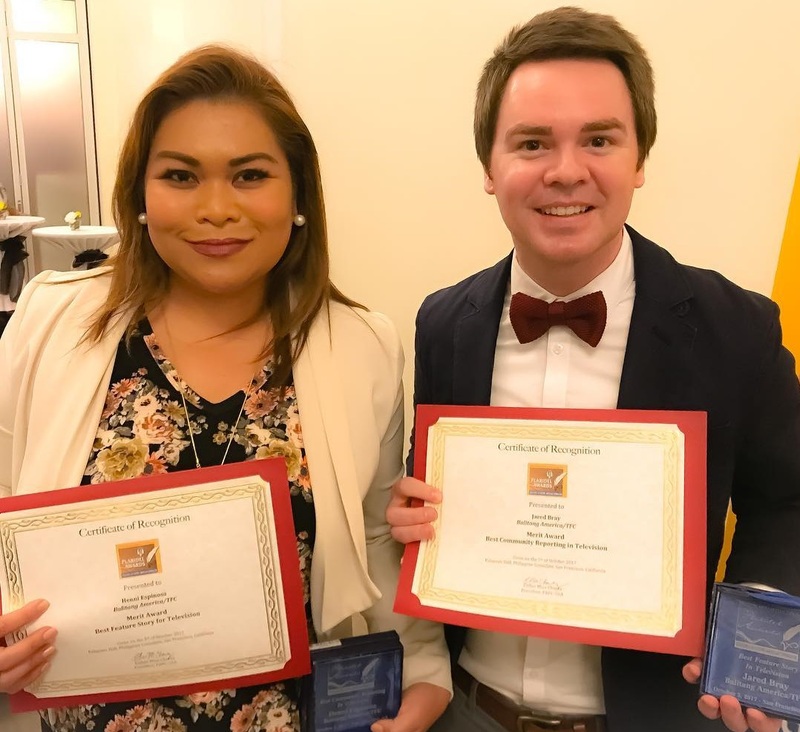 Just in time for Balitang America's 15th anniversary, two of its correspondents were honored at the 2017 Plaridel Awards, held on October 5 at the Kalayaan Hall of the Philippine Center in San Francisco. Longtime BA correspondent Henni Espinosa, who is also the news desk editor of ABS-CBN North America bureau, received the award for Best Community Reporting in Television for her profile of 12-year-old Filipino American dance prodigy Mahalaya Tintiangco-Cubales. "This is the story of any immigrant family. Immigrant parents who work two to three jobs to give their children all the opportunities in the world," Espinosa said in her acceptance speech. "I'm lucky that I've been with the newscast for such a long time. I've seen it grow and I've grown along with it. BA has been here for 15 years and I promise you, we are here to stay," she added. Jared Bray, meanwhile, took home his first Plaridel trophy since joining the Kapamilya global news team in 2011, winning in the Best Feature Story for Television category for his piece on Filipino "Designer Daddy" Nephi Gracia. "It's an honor to be here with you all. Punong-puno ako ng kagalakan," Bray said in his acceptance speech. "Pinoy ako sa puso and I love covering the Filipino community and telling the story of Filipino Americans, and so this means so much to me. Maraming salamat, Philippine American Press Club. Maraming salamat to the judges. Salamat ng pagkarami-rami to my mentors, Henni, Troy [Espera], I wouldn't be here without you." Bray, as profiled in an MNP Q&A two years ago, is the first American journalist to join the all-Filipino/Fil-Am team of The Filipino Channel's venerable newscast. Other winners at this year's ceremony were Christina Oriel of Asian Journal for Best Investigative Reporting; Eunice Barbara C. Novio of Inquirer.net for Best Feature Story; and Elizabeth Ann Quirino of Positively Filipino for Best Profile Writing, among others. The Plaridel Excellence in Filipino American Journalism Awards is an annual event organized by the Philippine American Press Club (PAPC). It recognizes excellence in Filipino American journalism and is open to all journalists whose articles/broadcast production have been carried by Filipino American news media.